If you are a visual artist or art dealer/gallerist in today’s ever changing visual art world, and you’re not aware or know about the Miami art fairs that take place each year-end and are clustered around Miami and Miami Beach, then you have a problem that needs urgent attention. 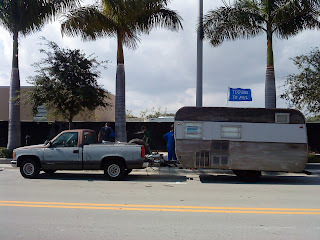 Almost a decade ago, the founders and organizers of a European art fair called Art Basel (which of course, takes place in Basel, Switzerland), decided to try an American version of their successful European model and started an art fair in the Miami Beach Convention Center and they called it Art Basel Miami Beach or ABMB for short. This was nothing new in the American art fair scene, as even in Miami art fairs such as Art Miami had been going on for years. But whatever right timing and combination of European flavoring added to Miami's Cubanized international art scene did was spectacular and ABMB took off like Meat Loaf's second album's title. In the halcyon days of the healthy economy of those days, the art fair proved to be a spectacular success, with millions of dollars of artwork by the blue chip names of the art world exchanging hands at ABMB as collectors from all over the world congregated in Miami’s balmy December to be seen at the sharp point of the spear of the contemporary art world. ABMB’s success soon spawned other art fairs, which are called “satellite fairs”, since they all revolve around ABMB’s dates and presence on America’s coolest and most international beach city. The evolution of these satellite fairs was fed by the fact that ABMB focused almost exclusively on European galleries and a handful of the top tier American New York galleries. In those days, even if you were the best gallery in Chicago, or LA or Miami itself, you had zero chance to be invited to ABMB. And thus satellite art fairs with names like Scope, Red Dot, Bridge, Pulse, NADA and others began to appear around Miami at the same time as ABMB. Soon, someone came up with the novel idea that these art fairs could also take place in hotel rooms, and the “hotel fair” was born. Many of these also began to appear, none better than the Aqua Art Fair, now called “the best hotel art fair in the world.” Having just done Aqua, I can testify brother, that the Aqua organizers have it down, and in my limited opinion, this is indeed the best hotel art fair in the world. Back to my story... by 2010, even with the economy in the doldrums that refuse to go away, there were 25 art fairs going on around Miami starting roughly around November 28 through the first Sunday of December. Yes dear readers, 25 art fairs at once! Some developed a tight focus, such as for Asian art or photography, others tried to establish an artist-oriented focus, but in general, all recognized that something special happens each December in Miami. By now the figures are mind blowing: I am told by Miami journalists from Rumor Control that during that week of the ABMB art fairs, roughly 20% of all the art work sold in the world exchanges hands in Miami. Furthermore, as the magnitude of the event grew, so did the attendance by both the “need to be seen” crowd and by even more worldwide collectors and, just as importantly, the press. Thus now the news media not only discusses what’s new or who’s hot in the art world, but also they let us know who Sly Stallone or other Hollywood stars of all magnitude are acquiring. It has become cool for Hollywood stars and wannabes to collect art, which in most Einsteinian dimensions is a good thing. The concentrated press reporting has also made celebrities out of mega collectors, such as the Miami based Rubell or DeLaCruz families. Most of the art fairs are gallery-focused; that means that it is art galleries, as opposed to individual artists, who exhibit artwork. The prices for the booths are spectacularly expensive, and generally, a small 200 sq. ft. booth can start at $10,000 or more, and a large booth can run as high as $100,000. And this is before a gallery adds other associated costs such as shipping costs of the artwork, transportation to/from Miami, customs, food, car rental, hotel and salaries. For most galleries around the world it is a daunting economic investment, which can turn into a financial disaster if sales fail to materialize. Around the DMV, only a handful of local area galleries took the risk over the last few years. Spaces such as Conner Contemporary, Civilian Art Projects, Hamiltonian Gallery, Fraser Gallery, Irvine Contemporary, and a precious few others, took the venture out to Miami. One local dealer, Art Whino, began its own model and sets up its own ABMB space in Miami during that week. “I meet more art collectors that week in Miami than the entire year in DC,” related one local art dealer. Individual artists have also begun to use the Miami opportunity to showcase their own approaches. None of these have been as cool or successful as Calder Brannock’s Camper Contemporary. So how does an artist get to Miami if he/she is not represented by a gallery, or their gallery doesn’t do art fairs or chooses not to bring your work to the party?